Do you ever have red bumps on your arms that appear out of nowhere? If so, you probably have keratosis pilaris aka chicken skin. Read on to find out about keratosis pilaris and how you can treat it. 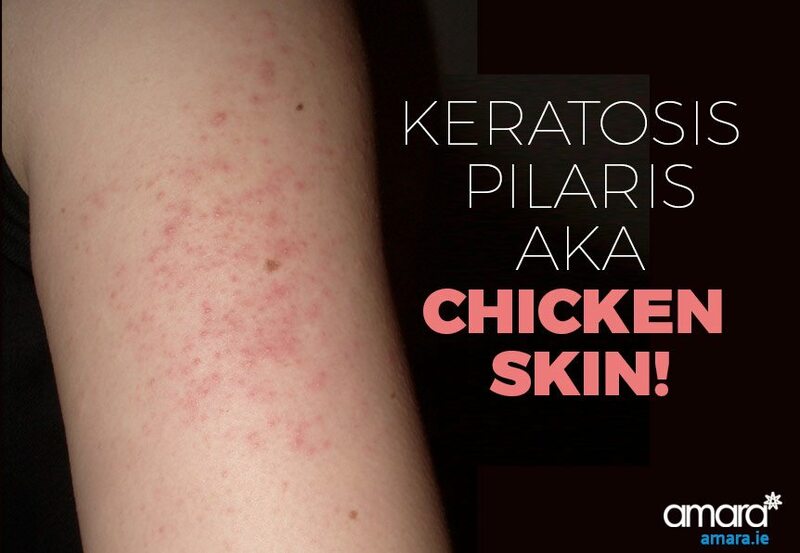 Keratosis pilaris, also known as ‘chicken skin’ (flattering right? ), appears as red bumps most commonly on your upper arms and sometimes your legs, buttocks or even your cheeks. Keratosis pilaris is most common between the ages of 14 and 25 however it has been known to stay longer on many people. How to Know if You Have Keratosis Pilaris? Keratosis pilaris looks very similar to ‘goosebumps’ however they take on a deep red colour and vary in size depending on your own skin condition and where they are on your body. Keratosis pilaris can flare up from time to time and sometimse disappear all together. I myself have keratosis pilaris and the look of the actual ‘goosebumps’ varies from week to week. Wearing tight clothing, particularly on the arms, causes friction as you move which can cause keratosis pilaris to flare up. Water that is too hot or too cold is actually quite bad for your skin. As with cleansing your face it is best to bathe in tepid water. Bathing for too long can also strip your skin making it dry which can also flare up keratosis pilaris. Over exfoliating damages your skin causing a buildup of keratin which leads to a flare up and redness. Like any spot/scar scratching or picking can make keratosis pilaris worse! Picking at a goose-bump will make it worse and could lead to an infection and could cause scarring. How Can You Treat Keratosis Pilaris? Depending on how bad each individual’s condition is you may decide to treat your keratosis pilaris in different ways but in general this is the process for treating keratosis pilaris. First you must make sure that what you have is indeed keratosis pilaris so you are not treating a different condition with the wrong products. Book in with a skin specialist who can tell you for sure. Avoid wearing tight clothing where you are suffering, this will avoid friction on the area. No Very Hot/Long showers! Some people will gasp at the idea of denying themselves a relaxing shower! Many times the stress of a skin condition is much more than a shower can cure! For many of us avoiding triggers might be enough to prevent keratosis pilaris from recurring, however for more severe cases a topical cream is needed. 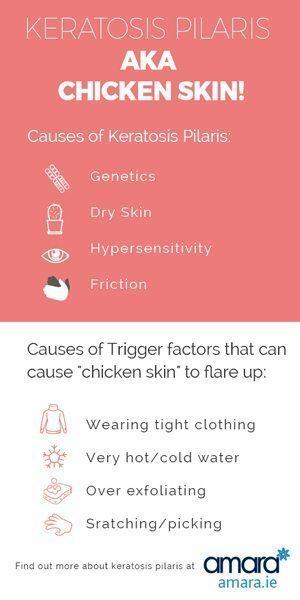 For those of us who want to remove their chicken skin for good using a retinol based cream daily can eliminate the red goosebumps. Though retinol can be found in many over the counter creams, a higher concentration (1%) is needed to see results. Investing in a higher concentration cream such as Oraser Body Emulsion Plus from the Dr ZO Skincare Range, renews dead skin cells and stimulates your skin’s natural process encouraging your body to remove these annoying red bumps and treat keratosis pilaris. If you’re interested in finally removing your keratosis pilaris then book now for your skin consultation! Our skin specialist will diagnose your condition and treat it for you.